Among the largest streets in a city, boulevards with side medians provide a ready-made opportunity for right-boarding open BRT lines. 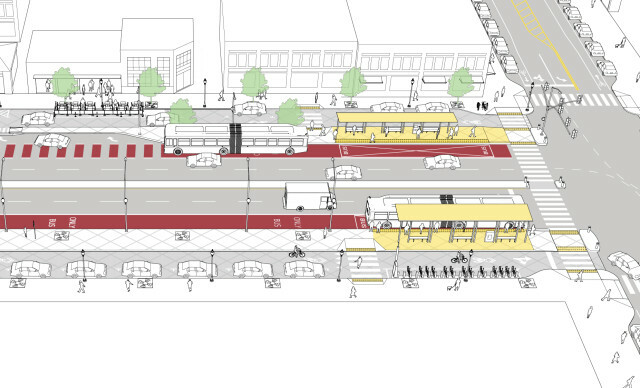 The configuration of the street into a central roadway and side-running service lanes, separated by medians, provides right-boarding buses with separation from local vehicle access, bikes, parking, and loading. Dedicated transit lanes on the right side of the main roadway, along the service road medians, can provide a transitway-like level of capacity, and serve a high volume of buses. On many existing boulevards, transit runs on the slower side roadway, which has sometimes been signalized to improve transit speeds. However, unmanaged turns create safety issues for all modes, while the large central roadway encourages high vehicle speeds. This configuration creates two very different street sections: one serving high-volume through movement, the other serving permeability and local access by all modes. On this boulevard, the right lanes of the central roadway have been assigned as bus transit lanes. Rapid stops have been upgraded to stations located on the side medians between the side and central roadways. Right turns from the central roadway are prohibited to prevent conflicts with through-moving buses and the side roadways. Turn lanes and protected turn phases can be provided for left turns, but lengthen signal cycles and increase delay for all crossing modes. Where local and rapid service share the bus lane, queue jump signals can be used to allow the rapid to periodically pass a local bus stopped at a far-side stop. This configuration has potentially very high capacity, capable of accommodating very high bus volumes (up to 30–50 buses per hour) due to the absence of competing curbside uses. Right turns are accommodated in mid-block slip lanes with a low-speed geometry and yield or stop controls to enter the side roadway. Slip lanes are long enough to avoid blocking the transit lane, and far enough from intersections to avoid being blocked by queues on the side roadway. Blank-out signs can be used to restrict right-side exits when the bus is approaching. The side medians are extended as refuge islands to the intersection edge to reinforce the right-turn restriction from center lanes. Left turns from boulevards are typically prohibited due to operational and geometric constraints; where a wide boulevard intersects a narrower street, the paths of left-turning vehicles from both directions come into conflict with one another. Pedestrian clearance intervals are timed to allow a full crossing of the roadway at a standard walking speed. Refuge islands permit slower pedestrians to cross in multiple stages. If the service lanes are stop-controlled, pedestrian clearance time can be reduced to the time needed to cross from median to median, reducing the total length of the signal cycle and transit signal delay. Side roadways are designed to prioritize pedestrians. Traffic calming measures reduce speeds, such as raising the service lane to mid-level or sidewalk level to create a shared street. Using high-quality paving, furnishings, and vegetation connects the sidewalk and median as a single public space. Side roadways can function as low-stress bicycle routes in a variety of configurations, including a low-speed shared configuration. Reduce through-traffic further by forcing motor vehicle turns periodically. Where side medians are sufficiently wide, or where space can be reassigned from the service lane, bike lanes or cycle tracks can be provided, benefiting from the same turn management strategies as the transit lane. Conventional bus fleets or streetcars can operate in the configuration shown. 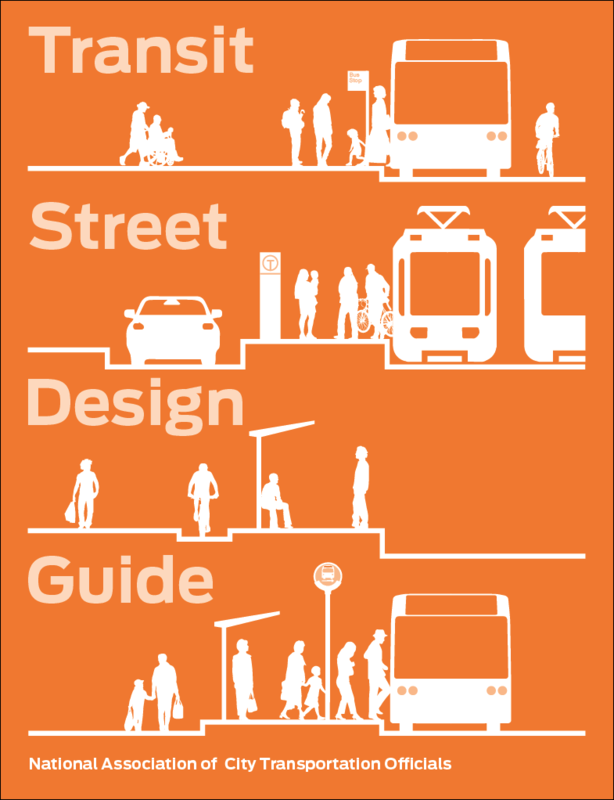 Rail or bus guideways can also be integrated at street level or raised to median height. The largest boulevards can support center-running BRT or LRT, even if side medians are present, as shown in the Median Rapid Transit Corridor configuration.